June 29, 2013: New poems published in The Weary Blues and Penduline. 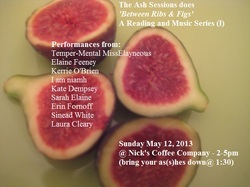 May 9, 2013: A lovely mention for The Ash Sessions does "Between Ribs and Figs" - A reading and music series (I) in the Irish Times blog. May 8, 2013: Thrilled to have my poem "Sweetness is for the Bees" featured on RTE Arena! (poem can be heard at 39:28 mark). May 6, 2013: The Black, Strong and Sweet Poetry Series launched. The Ash Sessions is pleased to present the “Between Ribs and Figs” Reading & Music Series. More details on the session here. April 21, 2013: For International Record Store Day Kevin Barry, Siobhán Mannion, Paul Lynch, Janet Cameron, Peter Murphy, Nuala Ní Chonchúir, Gavin Corbett, Sarah Clancy, Jim Carroll, Dimitra Xidous, Ferdia MacAnna and Oran Ryan pay homage to their essential albums here. New blog post up @ Dublin y Duende: 'Oh, tis a pickle alright...', because (and to paraphrase Oscar Wilde) - "We are all in the gutter, but some of us are looking at the pickles". In jars. That will not open. Coffee should be black as hell, strong as death, and sweet as love. And so should poems. Following the success of the Ash Wednesday Poetry Series and Reading, The Ash Sessions is pleased to announce the launch of the next series – the “Black, Strong & Sweet” Coffee and Poetry Series. Poems selected for the series will be showcased on the chalkboard at Nick’s Coffee Company. Each poet (and poem) will be featured on a blog that will accompany the series. In addition, line(s) from the selected poems will be displayed on the take-away coffee cups at Nick’s. The series will run from May to July 2013. Poems can be on any theme. Preference will be given to work that is visceral, ‘of the gut’, and full of duende. 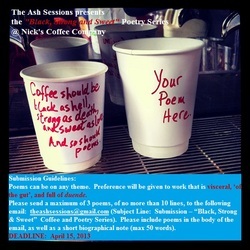 Please send a maximum of 3 poems, of no more than 10 lines, to the following email: theashsessions@gmail.com (Subject Line: Submission – “Black, Strong & Sweet” Coffee and Poetry Series). Please include poems in the body of the email, as well as a short biographical note (max 50 words). March 4 2013: Click here for a short reading of "Sweetness is for the bees" and "Peach Season", during the launch of Poetry Bus 4. You can purchase a copy of PB 4 here. March 4, 2013: Click here to view reading at The Monday Echo.